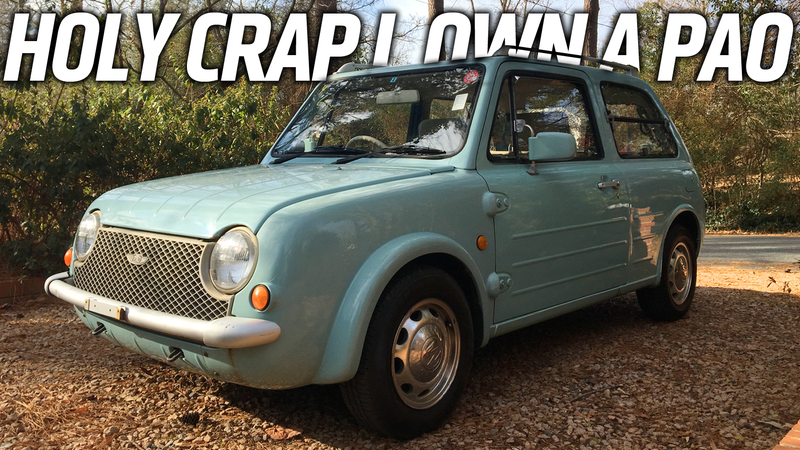 I’ve been wanting a Nissan Pao ever since I learned that they exist, and for many years the idea of owning one just seemed like an impossible dream. I’d like to have gills to breathe underwater, too, but at least those I wouldn’t have to import from anywhere. But now I look in my driveway and there sits a lovely 1990 Nissan Pao. I still can’t quite believe it’s real. When it comes to dream car ownership, I’m an extremely lucky man, and I attribute that to cultivating some pretty modest dreams. I own two cars I’ve always wanted to own: my 1973 Volkswagen Beetle and now this Nissan Pao. The Beetle we all know about, so let’s talk about the Pao for a bit, because it’s an interesting story as well. The Pao is part of Nissan’s late-Japanese-bubble-era experiment known as the Pike Factory. The goal of the Pike Factory was to build niche cars with as much design appeal as was available in other consumer products of the time—electronics, cameras, fashion, and so on. These were cars that were not designed to appeal to everyone, but would be cult classics for those that appreciated them. Four Pike cars were built, all designed under the direction of Naoki Sakai: the Be-1, the S-Cargo, the Figaro, and the Pao. Since I have a Pao sitting right in my driveway and I can think of nothing else, we’ll focus on that. The Pao’s design is interesting, because it’s clearly a retro-style design, but it’s not retro in the way we normally encounter. Modern retro cars like the VW Beetle, the Fiat 500, and the Mini take a design approach to interpreting past designs that’s sort of the opposite of the Pao: they translate old designs into a modern design vocabulary. Modern retro cars look like modern cars, and are interpretations of previous designs: the Pao, conversely, is a modern (well, for when it was built) car that actually uses older design vocabulary and methods. For example, the Pao has external, visible door hinges, it has actual corrugated body panels, it has bumpers that are simple tubes, basic round lights, flip-up rear windows, and so on. It’s a 60s-style body on a late ‘80s platform. Plus, the Pao isn’t about re-working one specific car: it’s like the designer went through a list of the best small car designs of the 1960s and put them all together into a Greatest Hits car that became the Pao. The front end feels a bit like a classic Mini, the overall shape is very Renault 4CV, the corrugated sides and flip-up windows are like a Citroën 2CV, the clamshell tailgate is like an old Austin, and even the license plate light is a dead ringer for what VW used on pre-’64 Beetles. There’s a little of everything. I bought this Pao from Gary Duncan’s amazing collection of cars, which we’ve covered here, with some awe, before. The one I got isn’t perfect, but it’s overall very solid, and all the fantastic details are there. The interior should have a warning that pregnant women who don’t want their fetuses exposed to extreme levels of charm should stay out. It’s amazing inside. There’s body-colored panels all around, the seats are covered in a tough, large-weave canvas that suggests some sort of adventure or safari car, the seatbacks have these amazing little ‘backpacks’ on them, the radio looks like a Geiger counter or something, and the whole thing is open and airy and delightful. I love being inside this car. The engine is from the Micra/March, a pretty common little hatchback Nissan sells in most of the world. It’s a 987cc four with an unusual electronically-controlled carb that makes all of 52 horsepower. The Pao came in both a three-speed auto and a five-speed manual, but I made sure to get a manual, because I want every one of those little ponies to get to the wheels. The Pao only weighs about 1600 pounds, so it really doesn’t feel that sluggish. Mine seems to drive quite well! It idles smooth, the power seems about right, and there’s no scary sounds or smells or anything. After many years of having a Reliant Scimitar as a project car, the idea of being in something right-hand drive and strange that isn’t always breaking down is intoxicating. There’s a few things I want to do to the car: I want put the factory foglights back on, I want to clean up some bits and inspect for any possible rusty areas to take care of, give it a good bath and wax, all that. But mostly, I want to drive this happy little freak. In fact, I just now took my wife to work even though she has a car because I wanted a reason to drive. It’s impressive when a car makes you willingly take a commute that isn’t even yours. Look at these seat backpacks! I want to drive it all the hell over the place, and make every errand or trip I take into an event that makes me enjoy life a bit more than when I started. My affection for this strange little bit of Japanese craftsmanship isn’t totally rational, I know—this thing is really just an entry-level hatchback in a fun get-up, but I don’t care. So far, in my very few drives and cursory inspections, there’s a few things to attend to: some wind whistling, likely from gaps where the rubber around the windows has shrunk, some bits of missing interior trim, a rubbing from the front right wheel at a full-lock turn, and a bit of thunking from some suspension bit at the rear. I’ve never had a car I can say that about before. All in all, nothing too bad. Just enough to keep it interesting. I can’t believe this thing is in my driveway. I’ve scrutinized these things on tiny JPGs on on computer screens for so long, it’s hard to wrap my head around the fact that there’s a real one, all 1600 pounds of it, right there in my driveway. This seems like a great way to wrap up 2017. I’ll keep you updated on how life with a Pao is. My initial prediction? Delightful.